Jay Glazer reports that the Broncos were aware of the suspension since before camp started. 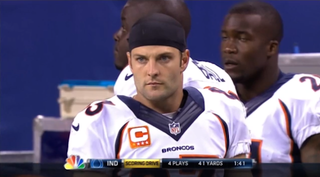 Update: Mike Florio's source says Welker had taken molly cut with amphetamines at the Kentucky Derby in May. Update 3: Cowboys cornerback Orlando Scandrick claimed to have a similar situation last month when he was given a four-game suspension. I'm as shocked as everyone at todays news. I want to make one thing abundantly clear: I would NEVER knowingly take a substance to gain a competitive advantage in any way. Anyone who has ever played a down with me, lifted a weight with me, even eaten a meal with me, knows that I focus purely on what I put in my body and on the hard work I put in year round to perform at the highest levels year-in and year-out. I want any youth football players and all sports fans to know, there are NO shortcuts to success, and nothing but hard work and studying, leads to success. I have never been concerned with the leagues performance enhancing or drug abuse policies because under no scenario would they ever apply to me, but I now know, that (drug-policy procedures) are clearly flawed, and I will do everything in my power to ensure they are corrected, so other individuals and teams aren't negatively affected so rashly like this. Welker was also handing out $100 bills to random people that day.